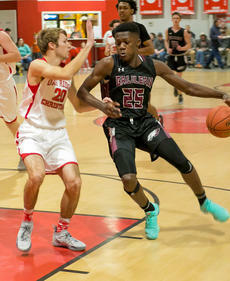 The first game after coming back from the event in Ohio was on the road at Glasgow Christian for Galilean Basketball. The Eagles had just picked up win number 20 in a season for the 12th season in a row and for the 17th time under Coach Scott Jones. Galilean freshman Aaron Brown makes a move toward the bucket in a recent road contest. Brown has registered 20-plus points and at least 20 rebounds in each of his last two games. In the early moments of the game, Galilean would dominate, but foul trouble reared its ugly head and put some role players on the spot against a quality opponent. Freshman Aaron Brown put together a career night as he scored 29 points and grabbed 20 rebounds while Cook put in 17 points to go with seven assists. Junior Caleb Burrows matched Cook to lead the Eagles with seven assists. Junior Preston Adams scored nine and added five helpers. Sophomore Aj Lightbourne scored eight points. The 77-53 win also earned Coach Scott a milestone, 500 wins as the Head Coach of Galilean men’s basketball. In the days after the Glasgow win, the National Athletic Association of Private Schools released their 1A National Rankings - Galilean showed up at number two in the country. The 22nd win of the season and win 501 for the career of Coach Scott Jones came in the form of a 77-53 victory over Region 4 foe Trinity (Lexington). Only six Eagles dressed for Galilean (22-6) in the win that moved GCA to 10-0 at home this season. Trinity (14-7) was a key player down as well, but both teams showed why Region 4 is the best in the KCAA. A back-and-forth first quarter ended with the home team on top 22-20. Trinity’s Clay Valentine was 4-of-4 from three in the period while Galilean got six points each from juniors Caleb Burrows and Preston Adams, three other Eagles scored as well. Over the next three quarters, Galilean pushed the lead out and finished off the KCAA’s number-four team 77-53. The Titans never had an answer for Burrows (24 points, six rebounds, four assists and a block to go with two steals) or Aaron Brown. The freshman had another career night on the boards and notched his 14th double double of the season with 25 points and 21 rebounds making it the second-straight game of 20-plus boards for him. Adams finished with his Galilean career high 17 points. Sophomore Chase Burton outworked his opponents all night on his way to six points and six rebounds while Senior Anthony Royalty added four points and seven boards. Eighth-grader Will Bennett finished with a point, but played big minutes every chance he had on the floor.